They will also show the NI League Cup Final the next day between Ballymena United and Carrick Rangers (Kick Off 5.30pm). Irish league football is returning to TV screens, it has been revealed. 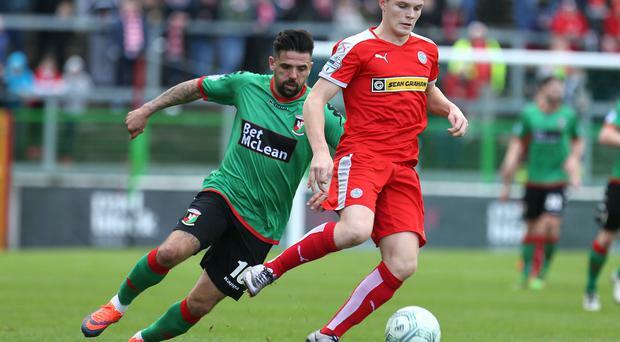 The NI Football League has announced a new agreement with Sky Sports which will see five Danske Bank Premiership fixtures and the NIFL League Cup Final shown live this season and in each of the next five seasons. The live broadcast agreement, which runs until the end of the 2021/22 season, kicks off this week with a double header of two games in two days live on Sky Sports. This will be followed by further games in March and April. The Sky Sports cameras will be in place at Solitude this Friday night as Cliftonville host Glentoran in the Danske Bank Premiership. “This is fantastic news for fans of Irish League football and I am delighted that the Danske Bank Premiership and the NI League Cup Final will be back on Sky Sports,” said Johnston. “Since the formation of the NIFL we have worked hard with our clubs, sponsors and media partners to develop and enhance the competitive structure and excitement of the League and I believe that Sky Sports customers will enjoy the passion, honesty and commitment of our clubs. Having averaged over three goals per game to date this season I believe viewers will not be left disappointed,” Johnston added.